A consignment of a hundred of the UK’s finest breeding sheep have been flown out to the United Arab Emirates as part of a model farm project to cultivate the desert. The export order was co-ordinated by Gloucestershire exporter and former Hampshire Down Sheep Society President, Mike Adams. He works with EBLEX to co-ordinate the British sheep presence at various overseas trade events and brokered the deal at last autumn’s Eurotier in Hanover. 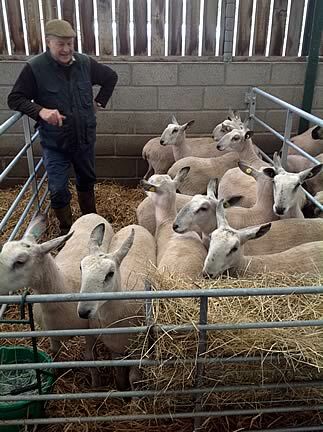 Mike said the criteria was that the sheep had to be performance recorded, from the top 25% of each of the five breeds chosen by the Sheikh, and scrapie free, with a particular emphasis on multiple births. The final choice was made with the UAE farm manager during a whistle stop tour of the breeders farms in December. He added: “I took out a hundred sheep from five different breeds, Hampshires, Suffolks, Texels, Blue Faced Leicester and Poll Dorsets and the idea is to decide what will actually thrive in temperatures in the high forties. Whatever works they will breed pure but then use the rams to improve the performance of the local breeds. “The farm is huge - 38 by 5 kilometres - and it’s wall to wall sand. The idea is to attempt to reclaim some of the desert and start growing their own food. It is a fast moving, exciting programme. Mike added that as well as using the sheep to improve the national flock and increase meat production, the strategy also involves using the dung to build fertility in the sand. The hope is that the constant pattern of 12 hours daylight and 12 hours darkness will encourage the sheep to become non-seasonal breeders so that lamb production can be geared to peak consumption periods. Their new home comprises barns created from mesh and date palms to create shade and air flow. Deep wheel washes help to protect against disease and efforts are made to deter scorpions and snakes! The ‘immaculate’ paperwork,together with a range of blood tests, took six weeks to put together. Great care was taken to ensure that the sheep travelled comfortably on the long drive to Amsterdam, followed by a seven hour flight to fog bound Abu Dhabi and Mike was delighted that they arrived in excellent condition.